“Wake up Camp Timberlake, it’s a newww dayyyy” reverberated through the cabins this morning as counselors and campers alike woke up and made their way toward the Tuck for breakfast. Following a great breakfast, the morning yell propelled the campers into a chapel where we sang a few favorite chapel songs and our friendly neighborhood Camp Director John M. told a True Story. The boys then proceeded to cabin clean up in order to continue the race for the coveted Golden Plunger (an award given to the cabin with the best cabin cleanup scores for the session). After the morning routine and rituals, the campers continued to their first two activities of the day, with newly revised schedules in hand. In first period paintball, Ethan C., Rees R., and Jonathan H. all received their bronze bar, recognizing their effort and progression in the class. First period fencing also had Zach M. and Hayes L. receive their silver bar, which puts them one bar away from the highly esteemed gold! Moving on to the second period, both Dylan C. and David S. split their cards in half while working on their riflery bars. 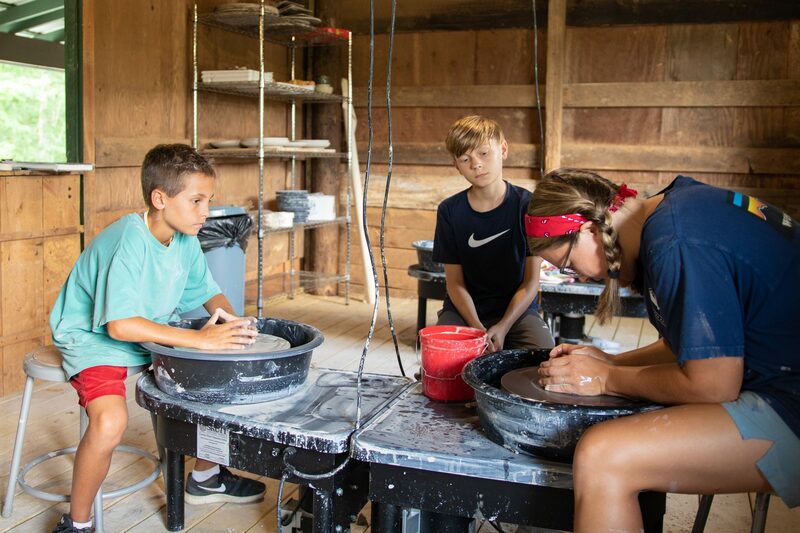 In pottery, campers worked on their creative sides by continuing session-long projects. After an active morning, Camp Timberlake gathered once again in the Tuck to refuel for the afternoon. Shrieks of excitement erupted when everyone got wind that the kitchen had outdone themselves with pizza AND pretzel rolls, along with a favorite soup and tons of options from the salad bar. Lunch also provided the opportunity for Dr. Dirt and Mr. Clean to report on the cabin clean-up scores. Much to the dismay of the good doctor, Camp Timberlake had exceptional scores. And the final event of lunch was to announce the winner of Ultimate Basketball (Sr. Camp) and Slip n’ Slide Kickball (Jr. Camp). And the winner is *drum roll* THE IROQUOIS. After Archie D. led his tribe in their chant and hymn, campers headed up to “the Best Time, Rest Time!” Following rest time, the campers snacked happily on their trading post, had a free swim, went to open activities, played John in Connect Four and had a great free time. When 3pm rolled around, the campers eagerly rushed to their afternoon activities. During third period, Parker C. showed his strength in swimming and claimed his silver bar! But third period wasn’t the only time the swimmers excelled. Fourth period began and Edward C. got his silver bar, and Dylan C., Diego T., Thomas M., and Alex W. got their bronze! Continuing the trend of excellence in the lake, Juan T. showed his canoeing skills and t-rescued multiple boats during class. However, there are some campers who did not participate the normal routine of camp today because they were applying their newly learned skills on trips! A mountain biking team took Enrique D., Magne E., Teddy O., Andres D., Drew J., Geoffrey M., Cole S., Charlie J., and Dash V. to the DuPont Ridgeline Bike Trail. These campers described this as one of the best mountain biking locations they’ve been to! However, those campers weren’t the only ones exploring today. Jack P., Charlie H., Harrison D., Davis O., Dallas M., Jackson D., Cullen L., Teddy F., and Sanders A., put their backpacking skills to the test on their trip. The third and final trip to go out was a rafting trip. Members of the Black Mountain Expeditions team took Jack B., Peter B., Scott B., Jackson D., JT H., Cullen L., Freddy V., Noah V., Grant S., Dallas M., and Owen W. on a whitewater adventure. As cabins and tribes were reunited at dinner to talk about the events of the day, the ceremony of Little Chief was announced as the evening activity, followed by a camp favorite, Counselor Hunt. Stay tuned to see which tribe catches the most counselors worth the most points!